Funny that my 300th post is from the same company that was the subject of my first official review. I don't get to hit DQ once a week anymore, but it's still nice to stop, especially when it's all of us packed in the car. 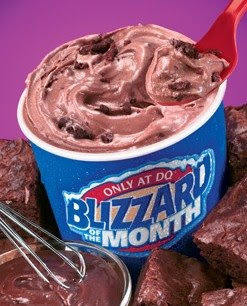 So the blizzard of the month is made with real fudge brownie pieces with double chocolate brownie batter blended into vanilla soft serve. Like last month, you wind up with a white and brown treat rather than the solid brown treat they show in the picture. This is easy enough to fix by stirring, plus it helps balance out the flavor. Overall, I like this month's blizzard. I'm sure you'll think even better of it if you are dying for a chocolate fix because this blizzard is as chocolaty as they come. Actually, it's borderline too much. I was ok with it since I was in the mood for chocolate, but my wife was a little put off. We still enjoyed them (me more than her), but be warned. I was actually surprised by the brownie chunks as well. I had a brownie earthquake sundae a long time ago and the brownies they served me that day totally ruined it for me. However, here the brownies are sliced thin and get the texture just right: pleasantly chewy, not to hard, and definitely not soggy. Technically, we have a third positive vote for these blizzards as well. My daughter regretted her blizzard choice after seeing how chocolatey ours were, so I gave her the rest of mine and started finishing her peanut butter cup blizzard. Tasty, but at the moment, the brownie batter one wins. Nick's 2015 Fanniversary Thoughts: Looking over Dubba's thoughts, I don't think things are the same as they were 6 years ago. This blizzard was chocolately for sure but far from being too much. You can still taste the vanilla from the soft serve here and there. This might be due to them not using a "double chocolate brownie batter". Well they could still be using the same thing but decided to ditch the name. Whatever the case, this isn't a chocolate overload by any means. The brownies aren't thin like Dubba mentioned either. They're slightly smaller than dice and in the majority of spoonfuls. They're more chocolatey than the ice cream mix and are some of the moistest brownie chunks I've encountered in a frozen dessert. These are definitely fresher than what you'll get at most DIY soft serve places and chewy to boot. This blizzard definitely gives me hope for trying more of them in the future. The consistency of the soft serve was far better this time around. 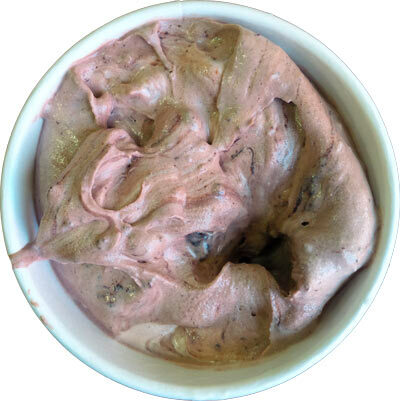 While it might not be something to go out of your way for like most of these treats aren't, if you're craving a chocolate brownie fix and a DQ is near by, give this baby a shot! Just had this last night and I was severely disappointed to say the least. I didn't get any "batter" flavoring - just straight up vanilla with decent amounts of brownie chunks and a few (2-3) chocolate flakes?? Maybe a 1/4 pump of chocolate syrup to give it a nice tan color. For the price I paid for a medium, should have bought Ben & Jerry's Chocolate Fudge Brownie instead.